Join us for this guided tour where members of the Gan Clan Association will bring you on a 30-minute guided tour of their new heritage centre. Please register early as seats are limited! 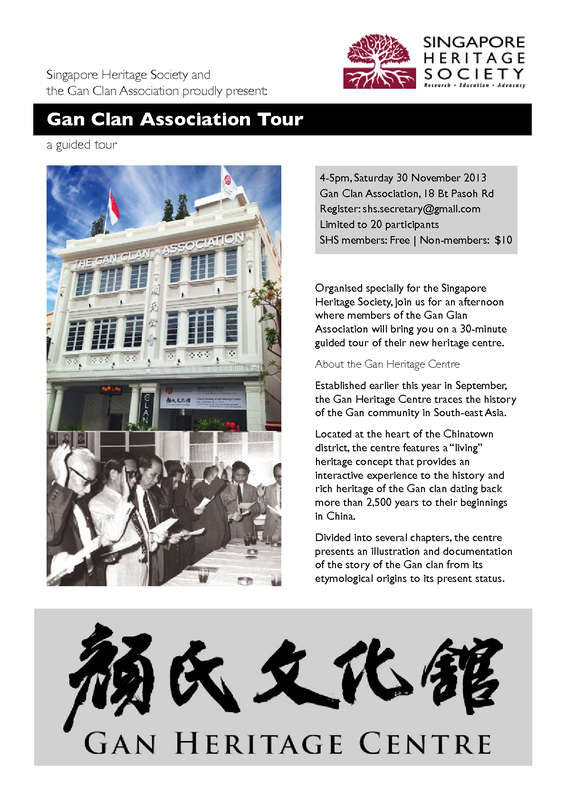 Organised specially for the Singapore Heritage Society, join us for an afternoon where members of the Gan Glan Association will bring you on a 30-minute guided tour of their new heritage centre. Established earlier this year in September,the Gan Heritage Centre traces the history of the Gan community in South-east Asia. Located at the heart of the Chinatown district, the centre features a “living”heritage concept that provides an interactive experience to the history and rich heritage of the Gan clan dating back more than 2,500 years to their beginnings in China. Divided into several chapters, the centre presents an illustration and documentation of the story of the Gan clan from its etymological origins to its present status.